If your dog's nail get too long, they can break. This is extremely painful and can result in infection. 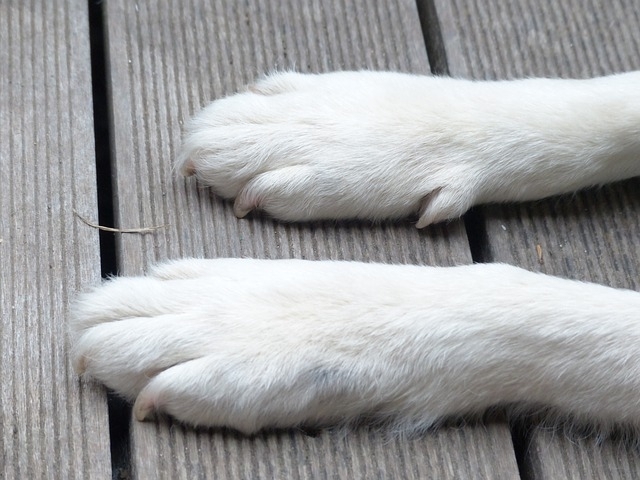 Despite it's importance, many people don't like to trim their dog's nails. It's a task that can make both dogs and their owners anxious. How do you know where to cut the nail? What if you trim the nail too close and hurt your dog? What if your dog seems worried? Trimming your dogs nails can be a daunting task, but follow these guidelines and you can consistently be successful. No matter what kind of dog you have, you can make nail trimming pleasant if you keep these two main ideas in mind! If your dog learns that nail trimming reliably leads to something wonderful (special treats, new toys, favourite games or walks), they will learn to love it! To start this, always follow nail clipping immediately with something your dog loves. For example, clip a nail then feed your dog a treat, clip another nail or two, feed another treat, and so on until your finished! Take a little extra time to slowly introduce the nail clippers, as well as the sensations involved in nail trimming! The first time you use the clippers, try trimming one or two nails, and avoid a full pedicure. And remember to introduce treats right away! Have everything you need (clippers, treats, toys) ready. Ensure your pet is nice and relaxed before you start. Hold the paw firmly and choose with nail you would like to trim. Identify the quick (contains nerves and blood flow). Use the clippers to cut the nail within a few millimeters of the quick. If you have a pet with dark nails, use small cuts. As you get closed to the quick you will notice a grayish colour within the nail. Stop cutting. If your pet is being extremely patient, you could even try filing the nails afterwards to make them smooth. If you are finding that nail trimming is not for you, give your vet a call and set up an appointment to have your dogs nails trimmed. If your dog seems significantly anxious at the veterinarians, ask the technician to teach you how to trim your dogs nails, and to ensure you feel comfortable taking care of your pet at home.